Police arrested Deiver Ramirez-Cobos after he was seen leaving a possible stolen vehicle and hid in a nearby home. 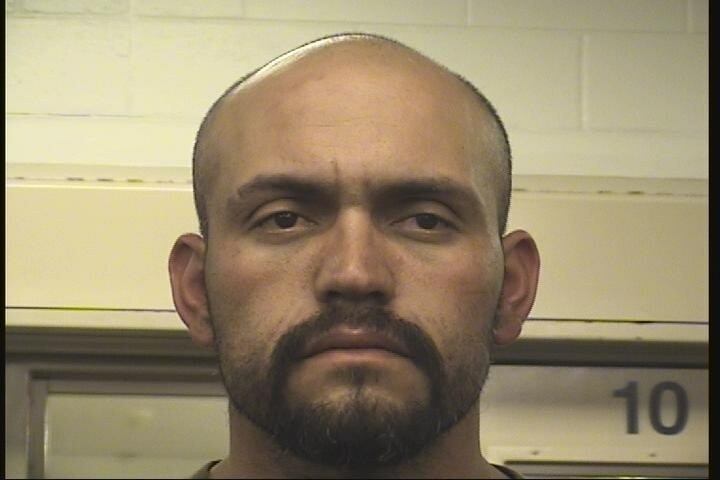 Devier Ramirez-Cobos, 35, was arrested and charged with Aggravated Burglary. Albuquerque Police Department Auto Theft detectives have been working hard to solve a case that involved a family who was moving to Oregon and passing through Albuquerque along the way. Local Media did stories on this theft that greatly affected the victims and left them losing all their personal belongings. These stories included surveillance video from the La Quinta of the theft as it occurred and was broadcast that evening. Detectives were aware of this theft and were keeping a mindful eye out for both the stolen truck and the stolen trailer. While detectives were working in the area of Wyoming Blvd and Central Ave when they observed the blue Chevy Suburban with the dark colored wheels which was highlighted in this story. The Suburban was observed at the McDonald's located at 8601 Central Ave. The vehicle was observed leaving the parking lot and detectives utilized Bernalillo County Sheriffs Office Air Support Unit to assist with keeping an eye on this vehicle. The vehicle stopped in the 400 block of Virginia St NE where the driver and a single passenger exited the vehicle and went into the residence. A perimeter was set up and public announcements were given which eventually got them both to come outside along with two females. The male driver was identified as Devier Ramirez-Cobos and his 13 year old son, Allan Ramirez. Both were taken into custody without incident. Officers spoke to the females who lived at the residence who both stated Cabos came to their door with a gun on his hip and told them to let them in. They said they were in fear of what Cabos may do if they did not and allow him inside. Both Cabos and his son hid in the bathroom where it was later discovered Cabos attempted to hide the gun he had in his possession. The gun was later determined to be a realistic looking BB gun. Since this arrest the victims truck and trailer have been recovered at separate locations. The truck was located abandoned in a neighborhood near Unser Blvd and Ouray Rd. The trailer was located in the backyard of a vacant residence in the 2300 block of Cardenas Dr NE. The contents of the trailer was still inside when officers recovered the trailer. A Crime Scene Specialist was called to process both the truck and the trailer in an effort to collect any evidence to lead police to link Cabos with the crime and to identify the male who originally stole the victims vehicle. We want to thank the citizens who called in and provided information on the abandoned truck and trailer. And thank our media partners who televised the surveillance video. Without these tips from citizens and the media coverage, the stolen vehicle and trailer would not have been located this quickly and the family possibly would not have been reunited with their possessions. Any further leads detectives get they will be investigating fully and anyone with any information is asked to contact Crime Stoppers at 843-STOP. Text "APD" + your tip to "274637"